On 24th June 2010, the Australian Government became the first national government to formally adopt the Charter for Compassion. The Charter is an initiative by religious historian Karen Armstrong, which aims to place compassion back at the heart of religious and public life. Australia’s leading politicians signed the Charter, and a plaque with the Charter’s text was accepted by Senator Ursula Stevens and a welcome to country by Ngunnawal Elder Agnes Shea. Bhante Sujato lead the group in a meditation on compassion. The emotion of the event was palpable, and was heightened by the fact that, as the meeting was progressing, we were losing a Prime Minister in extraordinary circumstances and gaining Australia’s first female Prime Minister. The atmosphere at parliament was electric, with hundreds of visitors pouring in. We could see first hand the pain and struggle of the politicians as they kept about their civic duty under tremendous stress. The ASA hopes that the everyday reminder of the Charter for Compassion will bring a little more kindness and gratitude into those halls of power. There are so many wonderful people carrying the Charter for Compassion flag here in Australia. I just wanted to give a “Shout Out” to some very noteworthy Compassion Champions. Anthony Orkin, a pro-active dedicated member of the Charter for Compassion team has been working tirelessly to ensure the Charter gets recognised and celebrated at both a grassroots and governmental level. Anthony was instrumental in helping launch the Charter for Compassion at Parliament House in June, and working with Waverley Councillor Yvonne Coburn to ensure that Waverley was the first council in Australia to recognise the Charter for Compassion. Of course, the talented, dedicated and passionate Yvonne Coburn deserves recognition for bringing the Charter into realms of Waverley Council. Yvonne has always shown much compassion and care in all her actions and this was illustrated again by her drive to officially recognise the Charter. Many thanks go to Yvonne and Waverley Council for bringing World Famous Bondi Beach into the realm of Compassion. Bianca Galgut, a 15 year old High School Student in Sydney, who went from class to class advocating the Charter and collect 231 Handwritten Signatures. Completely selfless and self-motivated, Bianca’s youthful energy is a wonderful example of how everyone has the ability to contribute to making the world a better place. Last but not least, Elizabeth Young from Adelaide, South Australia has championed the Charter in the evangelical Christian Community. Inspired by her experiences at the Parliament of World Religions, Elizabeth has collected hundreds of handwritten signatures and created great awareness for the Charter for Compassion. Congratulations on a wonderful job. Thank you to all our Champions for the Charter for Compassion. Your energy, dedication and passion is truly inspiring. Thank you for being the change. After months of planning the Parliamentary launch of the Charter for Compassion – the day finally arrived where both Australia’s major parties, Labor and Liberal, would stand side by side and commit to creating a more compassionate Australia. Little did the Charter for Compassion team know that the 24th June 2010 would become one of the most controversial and historic days in Australian politics. For those unaware of the context, Kevin Rudd Prime Minister of Australia, was superseded by his Deputy, now Australia’s first female Prime Minister, Julia Gillard. As one can imagine, most of Parliament House was mayhem on that memorable Thursday. A flurry of mixed emotions, concerns, controversy and confusion. Yet, in the heart of turmoil, in the ‘The Main Committee Room’, was a space, where the sentiments and feelings were very different – the overriding focus was that of Compassion. With great support, Parliamentary Secretary for Social Inclusion and the Voluntary Sector, Senator Ursula Stephens, ensured that the Charter was recognised and celebrated by the Australian Government. 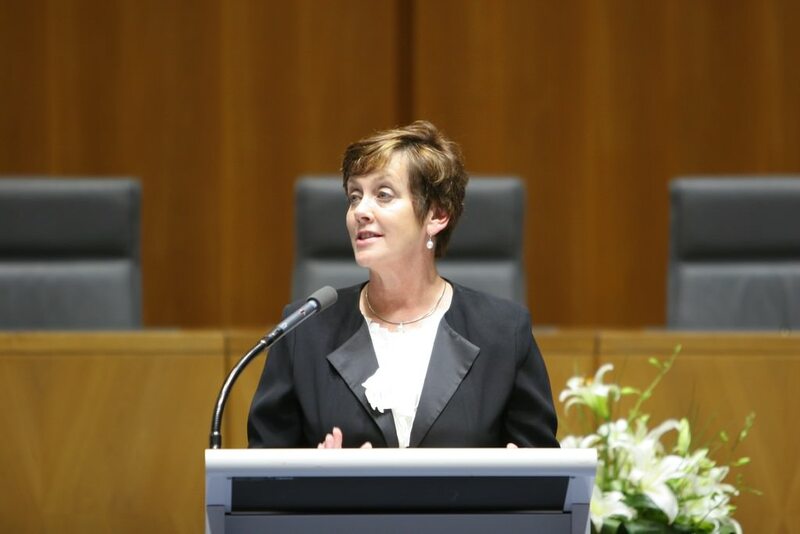 She said “For those of us who work in this place, the Charter reminds us that it is not just the legislated laws that shape a nation, but the way in which we behave to each other.” Senator Stephens also read out a letter from Prime Minister Rudd expressing the importance of Compassion in Australia. Shadow Minister for Ageing, Senator Concetta Fierravanti-Wells, addressed the room, expressing strong support from the Leader of the Opposition, Tony Abbott. The ceremony also included a special video message from Charter visionary Karen Armstrong, a Traditional Aboriginal Welcome to Country from Ngunnawal Elder, Agnes Shea and a meditation session with the Venerable Bhante Sujato from the Federation of Australian Buddhist Councils. Many thanks go to the religious, diplomatic, youth and community leaders who attended the event. A special thanks is also extended to Diversity Consulting and to Senator Stephens Office for sponsoring the event. 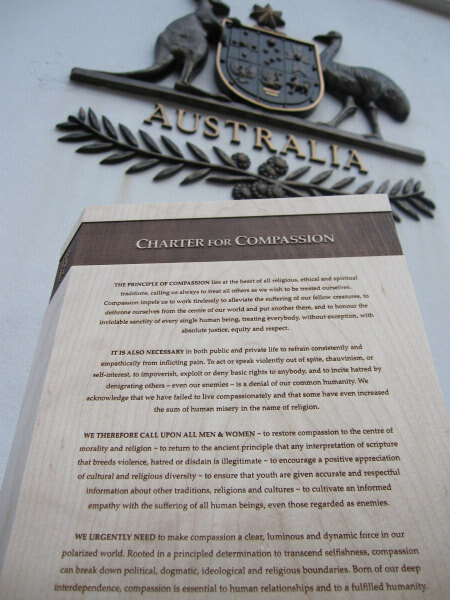 The 24th June 2010 will go down as a momentous day in Australian history for so many reasons – but for the Charter for Compassion team is was a victorious day towards Australia committing to a more compassionate world. 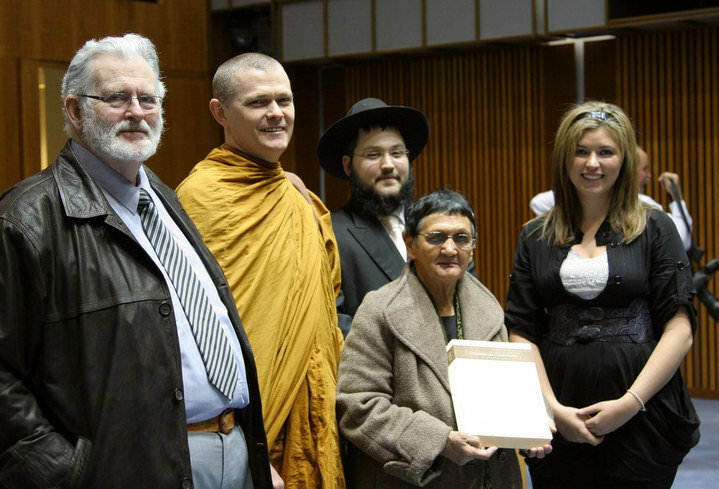 On the 24th June 2010, the “Charter For Compassion” will be launched at Parliament House in Canberra. Politicians, Diplomats, Religious and Youth Leaders will come together to celebrate Australia’s commitment to a compassionate society. Speakers at the event will include, Senator the Hon Ursula Stephens, Parliamentary Secretary for Social Inclusion and the Hon Malcolm Turnbull MP, Federal Member for Wentworth and a special message from Karen Armstrong. Help affirm Australia’s commitment to a more compassionate society. The message of the Charter for Compassion was taken to Africa on my recent visit to Zimbabwe and South Africa. I felt safe on a street walk through the jacaranda filled centre of the Zimbabwean capital, Harare. Zimbabweans are remarkably friendly and good natured which explains why there has been no revolution. Dodging cracks in the pavements, I saw glimpses of the splendor of this place that was once the Jewel of Africa and its breadbasket. Many of the offices are empty in a land where unemployment is conservatively at over 80% and where a quarter of the population, many skilled, have fled. The Zimbabwean dollar is no longer in circulation and has been replaced by the US dollar. At one point they issued a 100 billion dollar note which could purchase just three eggs. 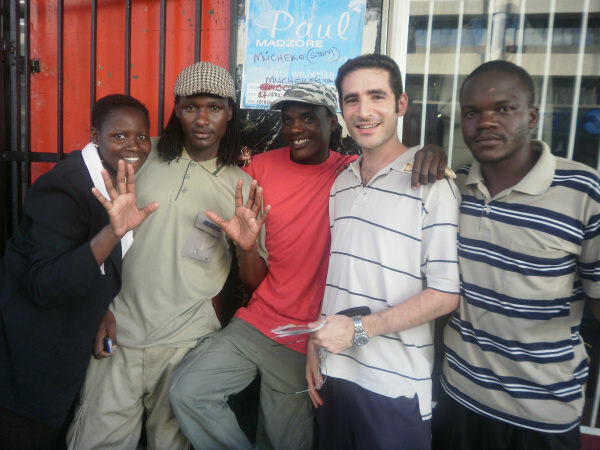 On one of the main streets, I met with young political activists from the MDC Party. They bravely run an information store, selling dvds and books, which is often shut down by police and their material confiscated. Despite the façade of a power sharing government, they told me “there is no democracy in Zimbabwe. We are not yet free”. In this photo, note the open hand salute. This is the symbol of the MDC and represents transparency. Mugabe’s Zanu PF Party has a clenched fist as its symbol. There is huge potential in Zimbabwe and investors, tourists and refugees will hopefully return when sanity and democracy prevails. In South Africa, I discussed the Charter with some inspirational people. The country is buzzing with Football World Cup fever. I promoted the Charter to a well known documentary maker, a senior strategist at the City of Johannesburg Council and a representative for the non-profit organisation, MaAfrika Tikkun, which does incredible outreach with vulnerable children in the sprawling townships. I was particularly thrilled to meet a dynamic young but experienced politician, Darren Bergman, the Democratic Alliance’s (Main Opposition Party in South Africa) Safety Spokesperson in Johannesburg. See the photo. Amongst his many responsibilities, he is at the forefront of confronting the horrific crime rate in South Africa. Darren is very keen to spread the message of the Charter in South Africa and collaborate with us in Australia. South Africa is fertile ground for the Charter with issues such as AIDS orphans and xenophobia against immigrants from other African countries. I recommend that you visit his brilliant website at http://darrenbergman.wordpress.com/ which talks about his uniquely South African experiences. Darren is also in the process of writing a book which will make a fascinating read. All in all, it was an unforgettable trip to Africa and an invaluable chance to advance the Charter. The whole world will enjoy the wonders of South Africa and Africa when the World Cup kicks off next month. The Charter for Compassion is beginning to take GIANT leaps forward in engaging Australia. I have just returned from a Charter for Compassion meeting in Boston – which can only be described as life changing. The meeting consisted of only a few select individuals. Fifteen people in total – including myself. Attendees included Charter creator Karen Armstrong, religious leaders Rev Dr Joan Campbell and Rabbi David Saperstein, members from TED.com, the Fetzer Institute, Harvard Professors and International representatives of the Charter. As you can imagine, sitting at the table with such well recognised and inspiring individuals was not only motivating, but life altering. To be honest, I’m still in shock that I was able to engage with such incredible people! It became clearer to me throughout the meeting, that notion that inaction is action. If we do not actively make the effort to live a Compassionate life then we will not live a life of Compassion. To be a compassionate individual requires one to step outside their comfort zone, stretch themselves beyond their own limits to experience a world beyond borders. Compassion is something that we can work on daily, it is an action that can be practiced from the moment we awake to the moment we sleep. Compassion is an activity that you can partake in! My hope is that you choose to become an active player. Over the next few months there will be very exciting initiatives happening with the Charter both locally and internationally. I sincerely hope that you decide to actively engage with us! If you are involved in projects of Compassion, please inform us! We would love to publicise your work. If you would like to assist us within our organisation than PLEASE contact us! We want to form a community of Compassion and I am looking to you – my fellow Australians – to be the change we wish to see in the world. In the meantime my friends, I’m sending much love and compassion.